Most APEX insurance claim projects are about restoring damaged surfaces or structures after a flood, fire or hail storm. This job was more like recreating a work of art during an epic Minnesota weather event. Thanks to our tough and talented trade partner, Valley Lake Flooring, the result is modern masterpiece. 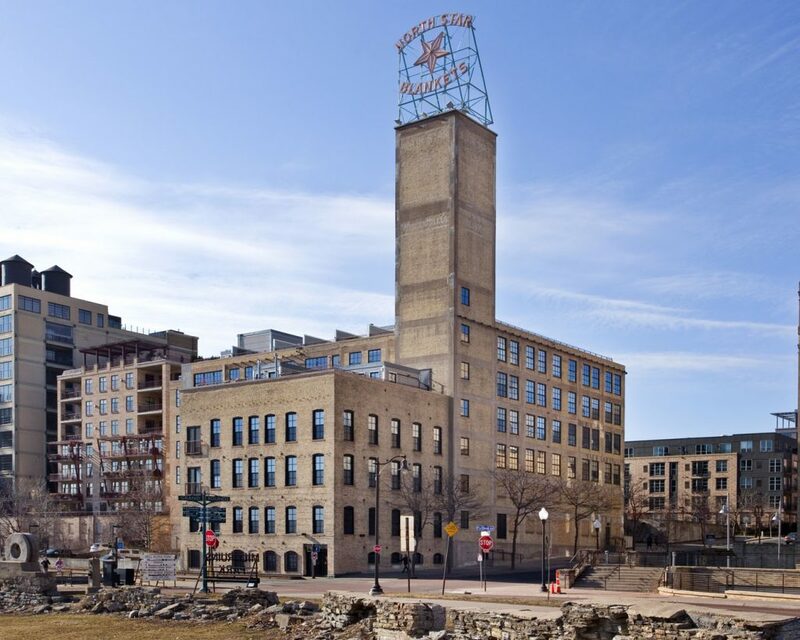 The challenge was to repair and replicate a decorative concrete floor in a two-level condominium in the historic North Star Lofts at 117 Portland Ave. in Minneapolis. Before its premium residential conversion, the property had been home to the North Star Woolen Blanket Company since 1864. 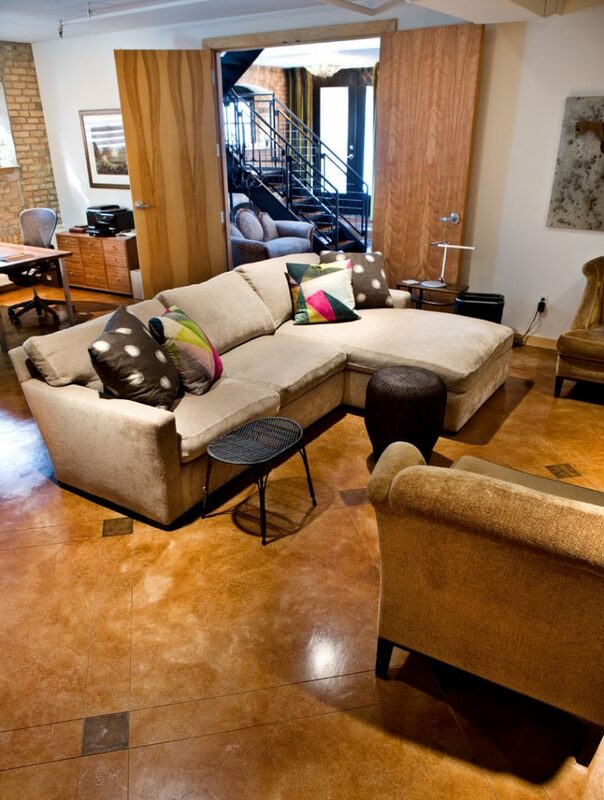 During the 1999 makeover, a continuous decorative concrete floor was installed that spanned two ground-level units. But when contractors jackhammered the slab in the adjacent condo to install wood flooring there last year, the vibration caused extensive cracking in the APEX client’s floor. 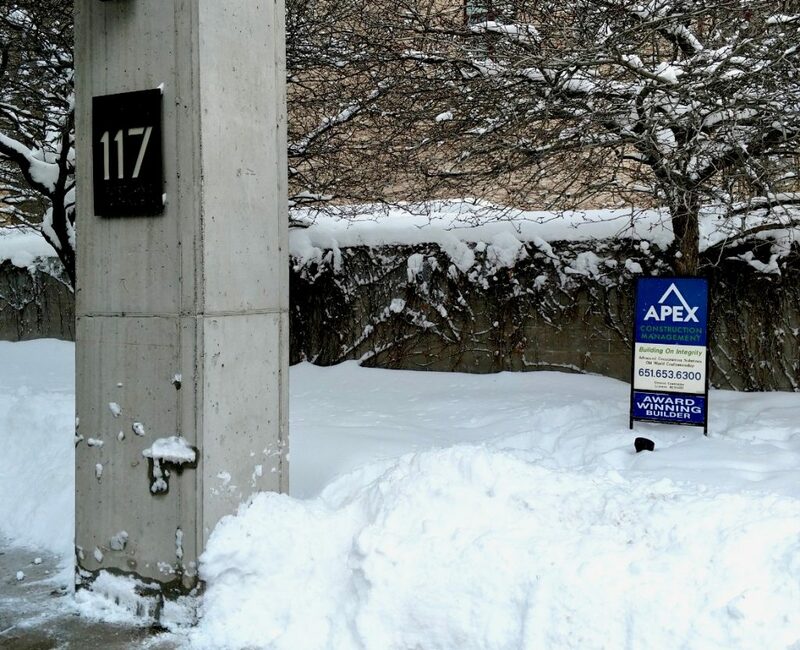 APEX oversaw the project and supported the insurance claim. Meanwhile, Valley Lake was responsible for repairing the cracks and restoring the surface. Adding to drama, the team was required to completed the bulk of the work in February at height of the Polar Vortex that gripped Minneapolis in record cold and snowfall. “It wasn’t an ordinary project and so I appreciate that APEX had the flexibility and the professionalism to handle a lot of strange and peculiar circumstances to get this done,” said homeowner Ben Whitney. He praised APEX President John “JB” Biancini for his refined systems. “JB has put together a series of processes to make sure that things are on schedule and everything is disclosed. And so I would recommend APEX to my friends and anybody else who needs a good general contractor,” he said. Before work could begin movers relocated all of the furnishings. APEX removed carpeting, baseboard moldings, closet systems and doors. And plastic curtain walls were erected to contain the dust. Next, Valley Lake Flooring embarked on a 15-step restoration and finishing process that involved grinding, filling, moisture-proofing, leveling, topping, scoring, staining, sealing and waxing the floor. Biancini said he enjoys taking on difficult and unusual projects for clients with high expectations. “Nothing about this project was easy. This is a historic structure. Building access was limited. The weather was awful. Fortunately, we worked with an excellent trade partner in Mark and the clients could not have been more appreciative of everyone’s extra efforts,” he said.